Renaissance Florence offers beauty in all its forms. Whether it is art and architecture, Tuscan food and wines, or contemporary design you crave, Florence is your city. Explore the city’s renowned museums and majestic cathedrals, linger in its bustling food markets and cafes, and discover Oltrarno and its charming neighborhoods. Stay in an apartment in the historic center. 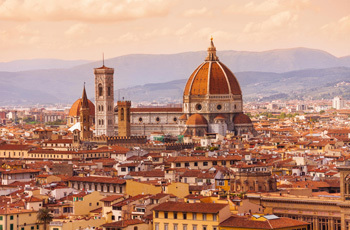 Sights to see: the Duomo, Ponte Vecchio, the Uffizi and Bargello Museums, the Accademia, the Pitti Palace, Orsanmichele, and many easy day trips! Day trips and Sightseeing: There are so many magnificent things to see in Florence: Visit the Duomo and climb the bell tower for even better views! The Uffizi museum holds masterpieces by Botticelli and Da Vinci. Michelangelo’s masterpieces are on view around the city, including David, in Galleria dell’Accademia. See Fra Angelico’s frescoes in the cloister of San Marco or Masaccio’s frescoes in the Brancacci Chapel. The churches of Santa Croce and Santa Maria Novella are filled with art. Shop for all manner of leather, ceramics and fashion accessories in the San Lorenzo street markets. Feed your fashion cravings at the Ferragamo Shoe Museum and the designer boutiques in the area. Take in the outdoor sculpture gallery of the Piazza della Signoria. Cross the Ponte Vecchio to take in the regal collections of the Pitti Palace and enjoy the view of the Duomo from the Boboli Gardens. Fiesole, just a short bus ride away, offers even better views. Pisa, Bologna, Ferrara, Siena and even Rome make easy day trips by train. Off the beaten track treasures that can’t be beat: Linger in the city’s cafes and people watch over a hot chocolate. Enjoy a slow Tuscan supper with the best local wines. Scour the outdoor antiques stalls for hidden treasures or buy farm-fresh produce at the neighborhood markets at Sant’Ambrogio and Santo Spirito. Florence has some of Italy’s best gelato shops. Across the river, explore the Oltrarno neighborhood’s quaint wine bars and antique shops. Favorite smaller museums include the Casa Buonarotti and the Marino Marini Museum. One or two weeks in a personally selected, centrally located apartment. Transfer by private driver from the Florence airport (or rail station) to your new Untours home, and transport back to the airport or rail station on your departure. A “Carta Agile” pass with the local city transit, good for 10 rides for each week of your Florence Untour; additional tickets available upon request. An orientation to the city and a walk around town with our on-site staff person to start your trip off right. A local cultural activity, like a dinner and arts crawl in Oltrarno. Local maps and literature, plus our own Untouring Florence guidebook, researched and written by Untours staff, full of the best restaurants and other suggestions. Ongoing support via telephone with our local representative. Help available when you need it.